Innovative Office Products (http://www.lcdarms.com) is now shipping its next generation Winston-E™ sit-stand desk. The Winston-E™ sit-stand is the perfect solution for anyone looking for a healthier work life-style for themselves or their employees. With the touch of a button, convert from sitting to standing all while maintaining a stable work surface. The Winston-E™ features a programmable positioning to maintain your ideal standing height and an incremental focal depth adjustment and tilt. The newly designed accessory tray is a catch-all within reach yet out of the way and a cable management system keeps the workspace free of clutter. The Winston-E™ features effortless electronic height adjustment, cutting-edge focal depth adjustment and independent movement of the 1, 2 or 3 monitors letting the user keep their monitors ergonomically adjusted for personal viewing or screen sharing. The Winston-E™ was designed with ease of use, style and functionality in mind. 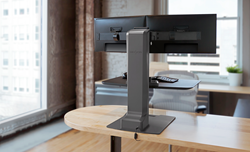 With robust electronics encased in a sleek design with modern edges and clean lines, the Winston-E™ is the sophisticated sit-stand solution to compliment the modern office. Visit LCDarms.com/Winston-E to learn about Winston-E™. To place an order call 800-524-2744. Innovative Office Products is an award winning market leader of monitor and tablet mounting solutions designed and manufactured to provide the best in flexibility, space savings and ergonomic benefit. Innovative leads the way in exceptional quality by combining product performance with award winning design. All products are tested to meet or exceed BIFMA standards and are backed by a manufacturer’s warranty. Innovative strives to reduce environmental impact through standard design and manufacturing procedures. Innovative assembles products in the U.S.A. at their manufacturing facility in Easton, PA.
For more about Innovative Office Products visit: http://www.lcdarms.com or follow us on Facebook, Twitter, Google+, LinkedIn, and our blog.